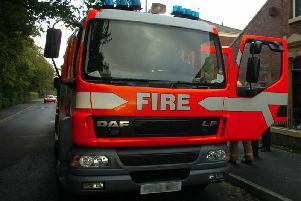 The cause of a shed fire in Chorley this morning is being treated as suspicious. Firefighters discovered two cylinders inside the shed when they attended the incident on Railway Road at around 7.30am. Fire engines from Chorley, Bamber Bridge and Greater Manchester were called. When firefighters arrived at the scene they found the shed was well alight and two cylinders were inside. They took the cylinders outside the building and cooled them down. They used a hose reel to extinguish the fire. Lancashire Fire and Rescue Service said there no injuries and that the cause is believed to be suspicious.